To play Cash Pot, start by setting your bet size. Coin value ranges from from £0.05 to £1. Then, choose the number of lines you want to bet on, which can be just 1 or 15. That means minimum bet is just £0.05 per spin, although we do recommend betting on more lines to increase your odds of winning and triggering the bonus games! Additionally, there’s a Wild symbol and a Bonus Scatter symbol that says “Free Spins” on it. As usual, the Wild symbol can substitute for all other symbols, except for the Bonus Scatter and the Gold and Silver Euros. 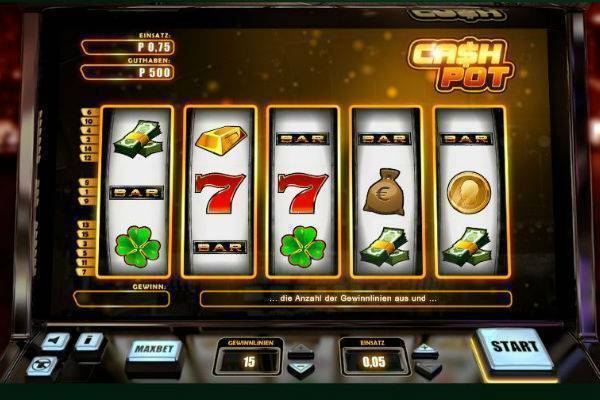 The fixed jackpot in Cash Pot is won if you spin 5 of the Gold or Silver Euro coins. This will get you 10,000 coins. So if you are betting at £0.05 per line, then you’ll pocket £500. If you’re betting £0.10 per line, then that’s a cool £1,000. Additionally, if you spin 5 Gold Euro coins, you can get a percentage of a small progressive jackpot, the payout of which will depend on your bet per line. If you’re betting at £0.05 per line, then you’ll get 5% of the jackpot, at £0,10 then 10%, at £0,25 then 25%, at £0.50 then 50%, and at £1 then the full 100% of it! Bonus Spins: If you spin 2 Bonus symbols (the one that says “Free Spins” on it) on the first 3 reels from the left, then you’ll get up to 2 Bonus free spins. During these spins, the reels where the Bonus symbols landed will be sticky and stay locked, while the other reels get a respin. Free Games: Spin 3 or more Bonus symbols and you’ll trigger a round of free games. 3 Bonus symbols get you up to 10 free spins, 4 symbols up to 15 free spins, and 5 symbols up to 20 spins. Alright, so Cash Pot is not the most brilliant looking game we’ve come across. It looks like an old school classic slot machine, except with more reels. It’s also quite literal, the symbols show you that’s all about the money. The sound is pretty old school too with the usual digital whirling and beeping you except from slot machines. Aesthetically, Cash Pot might not be everyone’s cup of tea, but at least the message is direct here and there’s no fudging around. Cash Pot isn’t a particularly flashy slot, and looks rather like a classic slot machine. However, it’s souped up with extra reels to make it a 5 reel game, plus it’s got bonus free spins and a jackpot up for grabs, so there’s definitely some monetary excitement up ahead with this game. Give it a spin for yourself at one of the recommended online casinos on our site!